So two years ago, I got an idea. 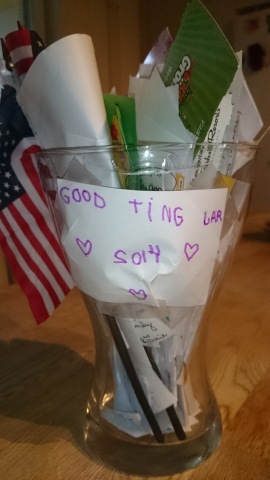 I started the Blomberg ‘Good Things’ jar. Whenever something good happens, we toss a reminder into the jar. If the kids had fun at a birthday party, the invite goes into the jar. If I wrote a fantastic short story, I write the moment on a strip of paper and slip it in the jar. Sledding, days at the park, visits with friends, good conversation with an adult, a great massage, a new accomplishment, a date–all of these things and more make it into the jar. At the end of the year, we pull them out. Last year, during a magnificent dinner on New Year’s Eve, which I can’t remember, but I’m pretty sure was yummy, we took turns reading aloud the strips of paper and remembering all the good times we had throughout the year. Times we had somehow forgotten. We’re a little late this year, but I plan to read through these tonight over a heaping bowl of Hoppin’ John, a traditional New Year’s dish in the southern part of the States. I hope as we empty the jar, we’re reminded of the blessings we have in our lives, of the laughter and love that surrounds us. I know 2015 will have just as many blessings and disappointments as 2014 did, funny how life works that way, but I hope we always remember to take a moment to jot down the small, happy moments that make up life. Because I don’t want them to get lost. May your good things jar, whether tangible or intangible, overflow with good things in 2015 :). This is such a brilliant idea – I must try this!! Happy new year to you! Thanks for stopping by! I’m glad you like the idea =). It really is a lot of fun to do a happy dance for something and then remember, ‘oh, I’m putting this in the Good Things jar!’ Hope you have just as much fun with it and happy new year to you, too! I love this idea Cas, I’m going to try it out! Thanks! Hope you do, it’s a ton of fun!